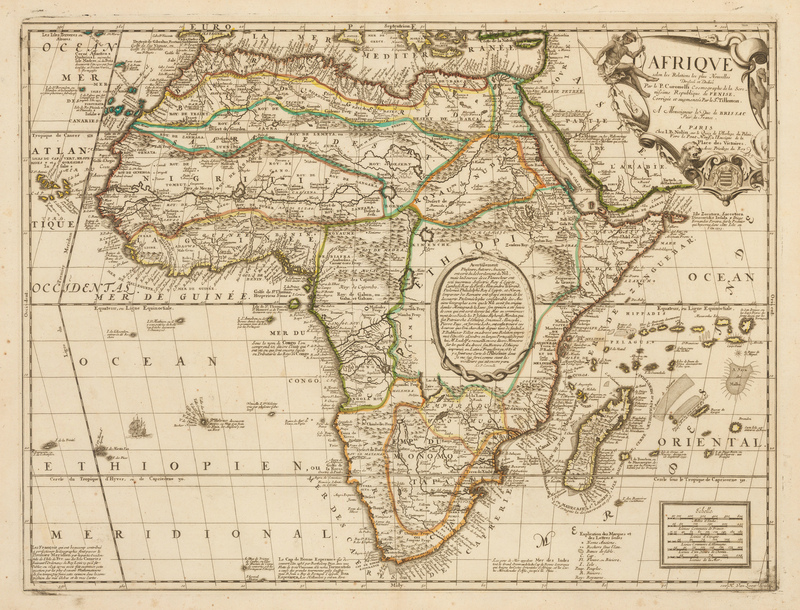 This authentic antique map of Africa by Jean Baptiste Nolin is considered a major accomplishment in the mapping of the continent, as its place names reflect the ever-increasing knowledge provided by European explorations and expeditions, and the settlements created in their wake. It refuted beliefs regarding the source of the Nile which had held sway from antiquity till as late as the 18th century. Ptolemy believed that the Nile had its source in lakes located in the mythical ‘Mountains of the Moon’ in Central Africa. Rather than depicting the lakes, an oval cartouche formed by two entwined snakes surrounds text explaining that the mountains were more fiction than fact. Perilous areas of the open seas are noted, and a lovely sailing frigate graces the south Atlantic. Text annotations describe the explorations by Petro Paez and Manuel de Almeida, and the Nile as it was known in antiquity. The map was compiled and engraved in collaboration with Vincenzo Maria Coronelli, who was working on a grand Celestial and Terrestial Globe for the King of France in Paris at that time. The title cartouche depicts an aborigine in tribal dress, a fantastical fish, a snake, a lion and a camel along with the royal crest. Condition: This map is in B+ condition, with original coloring. Toning around the outer edges of the borders, foxing, and some rust spots. Small tears of the outer edge of the border have been repaired with archival materials on the verso.